JAKARTA, Indonesia — The "black box" data recorder from a crashed Lion Air jet shows its airspeed indicator malfunctioned on its last four flights, investigators said Monday. Hours earlier, distraught relatives of victims confronted the airline's co-founder at a meeting organized by officials. National Transportation Safety Committee chairman Soerjanto Tjahjono said the problem was similar on each of the four flights. That number included the fatal flight on Oct. 29 in which the plane plunged into the Java Sea minutes after taking off from Jakarta, killing all 189 people on board. Erratic speed and altitude on the plane's previous flight, from Denpasar on Bali to Jakarta, were widely reported. "When we opened the black box, yes indeed the technical problem was the airspeed or the speed of the plane," Tjahjono told a news conference. Tjahjono said that he hoped to have a detailed preliminary report within a month, CBS News' Selvanaban Mariappen reports. Indonesian investigators, the plane's manufacturer, Boeing and the U.S. National Transportation Safety Board are formulating a more specific inspection for Boeing 737 MAX 8 planes related to the airspeed problem, Tjahjono said. "If there are urgent findings to be delivered, we will convey them to the operators and to the manufacturer," he said. Lion Air has said a technical problem with the jet was fixed after problems with the Bali to Jakarta flight. Investigator Nurcahyo Utomo said investigators need to review maintenance records, including what problems were reported, what repairs were done, including whether components were replaced, and how the repairs were tested before the two-month-old plane was declared airworthy. "Currently we are looking for the cause of problem," he said. "Whether the trouble came from its indicator, its measuring device or sensor, or a problem with its computer. This is what we do not know yet and we will find it out." Rusdi Kirana, Lion Air's co-founder, was not invited to speak by Transport Minister Budi Karya Sumadi, who moderated the meeting between relatives and the officials who are overseeing the search effort and accident investigation. But he stood and bowed his head after angry and distraught family members demanded that Kirana, who with his brother Kusnan Kirana founded Lion Air in 1999, identify himself. "Lion Air has failed," said a man who identified himself as the father of passenger Shandy Johan Ramadhan, a prosecutor in a district on the island where the flight was headed. "I want Mr. Rusdi Kirana and his team to pay attention," he said. "Since the time of the crisis, I was never contacted by Lion Air. We lost our child, but there was no empathy that Lion Air showed to us." After the meeting, Kirana left in a hurry, avoiding questions from reporters. Many families face an agonizing wait for missing relatives to be identified. Police medical experts have received nearly 140 body bags of human remains and have identified 14 victims. 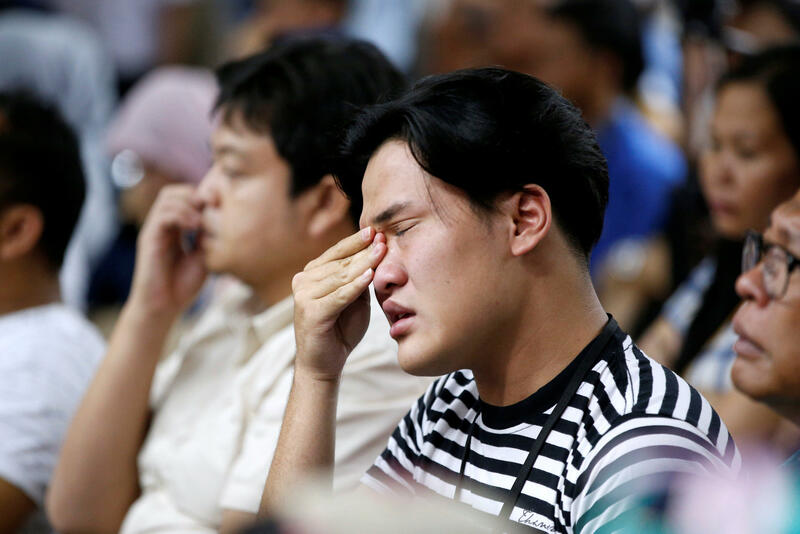 Relatives questioned why the plane had been cleared to fly after suffering problems on its Oct. 28 flight from Bali that included a rapid descent after takeoff that terrified passengers. "Lion Air said the problem was fixed, is it true the problem was cleared?" asked Bambang Sukandar, whose son was on the flight. "If not, technicians in charge must be responsible." "The law is absolute," he said, "because they have stated that the plane was cleared to take off again. These bad technicians must be processed by law to prevent plane accidents from continuing in Indonesia." "The plane was intact when it plunged to the sea, it did not explode in the air, and the aircraft engine was running when it touched the water at high RPM — it's marked by the loss of all blades of the turbine," he said. The Lion Air crash is the worst airline disaster in Indonesia since 1997, when 234 people died on a Garuda flight near Medan. In December 2014, an AirAsia flight from Surabaya to Singapore plunged into the sea, killing all 162 on board. Lion Air is one of Indonesia's youngest airlines but has grown rapidly, flying to dozens of domestic and international destinations.